This is a really interesting car. Back in the 60s Innocenti was building BMC cars under license for the Italian market. Basically at the time they were making minor changes to existing BMC cars. The Innocenti Sprite was different. Based on the Austin Healey Sprite platform and running gear, the Innocenti Sprite had a completely different body and features (roll up windows, trunk, standard heater, etc.) that the Bugeye Sprite didn't have. The Bugeye Sprite may have looked cute, but the Ghia designed Innocenti Sprite looked purposeful. However, the Innocenti was heavier than the Austin Healey Sprite and used the same BMC 943cc engine (until 1964), so it was actually slower then the Bugeye. Like the Austin Healey, it was considered a good handling car in its day. There were just over 4000 of these built in total (1960 - 1969, including a very rare coupe version). Most stayed in Italy but a few were sold in the US. Not many survive. 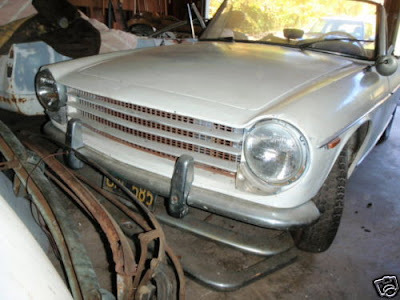 (The seller says that there are 30 or so left in the US) This is one of those cars that deserves to be restored and a car that would be a hit at any Italian or British car show. Click here for a brief history of the car and great pictures of a restored example. I used to have one of these many years ago. It was light grey just as in the photo. I painted it red like the photos in the link. Does anyone know what the car on eBay sold for? The rear suspension is different than the British car. Made the car handle better than the Sprite which I have driven also.